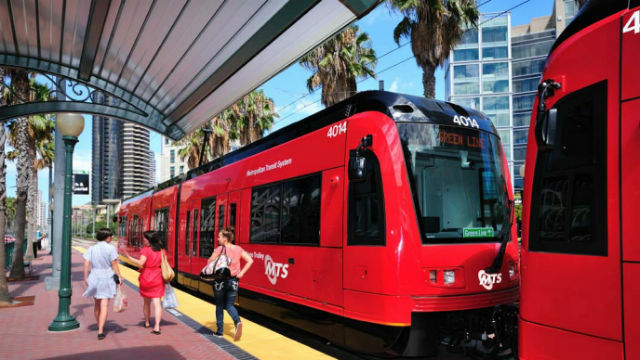 SANDAG released an updated regional plan Friday that shows how the San Diego region can prepare for 1 million new residents and nearly 500,000 more jobs in 2050. The plan envisions higher densities, much more multi-family housing and greater use of public transportation. Spending on the regional transportation network over the next three decades would total $204 billion, half of that for public transportation. “Denser neighborhoods, particularly in the western third of the San Diego region, will offer housing, jobs, and services closer to one another – and importantly, closer to the regional transportation network,” the study notes. The region’s population will grow by 1 million, requiring 489,000 more jobs and 330,000 more housing units. Most of the region’s population growth will come from growing families who already live here. More than 82 percent of the growth in housing will be in apartment buildings, condo complexes, and other multifamily dwellings as opposed to single-family homes. The region’s population is aging. Nearly 20 percent will be at least 65 by 2050. The population will grow more ethnically diverse. Nearly half of the region’s population will be Hispanic, and more than 15 percent will be Asian. Thanks to higher densities, 55 percent of the region will be preserved as open space and parks, habitat or farmland. The 172-page plan was released for public review and comment, and the agency has scheduled a series of public workshops. The workshops will begin May 12 in Escondido, and continue May 13 in La Mesa, May 14 in Old Town, May 20 in Oceanside, May 21 in San Ysidro, May 27 in San Diego and May 28 in University City.